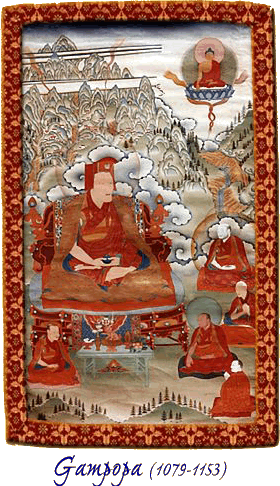 GAMPOPA WAS ONE of the great fathers of the Kagyu Lineage of Tibetan Buddhism. He was the most famous disciple of Jetsun Milarepa, and is known for combining the Kadampa tradition with the Mahamudra teachings. 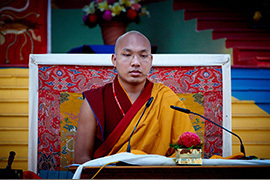 The following spiritual biography of Gampopa was presented by the Khenpo Karthar Rinpoche. Milarepa's foremost student was Dakpo Rinpoche, Gampopa, who was born in the year 1016. Gampopa was already a bodhisattva during his many previous lives and incarnations. During the time of Shakyamuni Buddha, the fourth Buddha, Gampopa was his student, and a bodhisattva and healer who healed people by giving herbal medicine. Sometimes also, merely through the hearing of his name, or sometimes just by his touching the place of illness, he could heal diseases. During the period of Shakyamuni Buddha, he heard Buddha reciting and teaching on the Vulture's Peak in India. He invited Shakyamuni Buddha and all his other students, all the other bodhisattvas, to his home. There, Shakyamuni Buddha gave a teaching on the sutra known as the Samadhi Raja Sutra. Having revealed this teaching on the Samadhi Raja Sutra, Buddha then asked all his students to volunteer to spread the teaching of the Samadhi Raja Sutra, giving the teaching in its essential meaning. 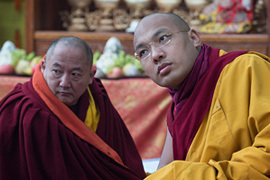 Dakpo Rinpoche stood up among all those accomplished students (generally when Dakpo Rinpoche is mentioned, he is not Dakpo Rinpoche yet), and promised in front of Shakyamuni Buddha that he would spread that sutra and make that sutra available for future beings. When he made that commitment, Shakyamuni Buddha also promised that during the time when Dakpo Rinpoche would actually spread the sutra and benefit all living beings, he himself, the Buddha, would help cultivate and establish the teaching firmly. So, having promised the Buddha to spread the teaching of the Samadhi Raja Sutra, Gampopa later took rebirth in 1079. In his childhood he displayed many splendid qualities. At a very young age he was interested in many teachings. Because of his interest, his openness, and his devotion, he received many teachings from many gurus. In addition, he was highly interested in medicine, as he had been in the past. So he studied medicine and became a doctor. During that time his name was Sonam Rinchen. He had such qualities as to be able to study Dharma, become a doctor and a healer, and also he had a wife and a family life. He lived a family life until he was 24 years old, at which time his wife became very ill. It did not matter that he was a great doctor and healer; she still became very ill. And regardless of what medicine or method he tried to heal her with, it did not work. And although she was in great pain and seemed to be dying, she was unable to experience death. Realizing this, he asked her why she seemed to be so attached to her life. His wife said, "I am not attached to possessions, nor wealth, nor faith, but I am very attached to you. Because you are only 24 years old, and you are very handsome, it is very hard for me to leave you. It is because my attachment to you is so very strong that I am unable to experience death." Knowing there was no cure for her illness, and at the same time understanding that her attachment to him prevented her from dying properly, Dakpo Rinpoche promised that he would take the vow of complete celibacy, never to marry another woman, and to become a monk. This promise released her from her unnatural attachment, and she experienced her natural death. 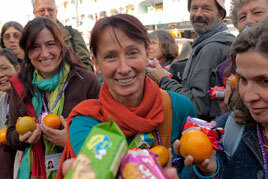 So, as he had promised his wife, he took the vow of a monk in the Kadampa tradition and went into retreat. There he practiced meditation through the Kadampa tradition and saw signs and had many mystical experiences. Yet this practice did not satisfy him completely. Although he was in retreat, one evening he saw three beggars outside his cave. They seemed pretty hungry, and they were sitting around fantasizing about what they wanted. One of the beggars said, "I wish a cup full of tsampa, with lots of butter, would fall from the sky, and we could all enjoy it." The other beggar said, "Come on, that is too small a thing to wish for, just a cup full of tsampa. That is nothing. I wish I were a king. In fact, I wish I had the power and the wealth of the kings of all Tibet." Then the third one said, "Well, gaining possessions or becoming a king seem very temporary to me. Since everything is impermanent, everything is bound to change. I wish," he said, "that I had the power and realization of the great yogi Milarepa. That realization, that energy and power, is not destructible, is not subject to change." On hearing the name of Milarepa spoken thus by the beggars, Dakpo Rinpoche immediately fainted; so strong was the connection sparked in him when he heard Milarepa's name, that he just passed out. The next morning he made a special Tibetan butter tea and tsampa and invited the three beggars to have breakfast with him. He asked the older beggar about wanting to be like Milarepa, where Milarepa lived, and the direction of the path. When he obtained that information, he immediately and without a second thought left the retreat hut to find Milarepa. With eager excitement, Dakpo Rinpoche walked for about a month and a half to where Milarepa was. While on the way he came to a house and asked if he could stay the night. The elderly woman who answered the door was wrapped in many cotton cloths. She asked who he was, and he said he was Sonam Rinchen and had come to meet the great yogi known as Milarepa. The lady then insisted that he stay at her house, because not only she, but her daughter also, were devoted students of Milarepa. In fact, Milarepa had told her and her daughter that the son of a very noble family was coming to be his student, and that they were to assist him in any manner they could. Milarepa had also told her daughter that they would accumulate great merit in accommodating him, so they hoped he would stay the evening. The next day, Dakpo Rinpoche went to see Milarepa. Before he got there, Milarepa sent one of his students to meet him. The student gave him a bunch of wood, dry twigs, and tea, with a message "You have developed pride, you have become quite egoistic, therefore you must remove the stain, the obscuration of that pride. Keep the wood, go under a rock, and stay there until you have purified the stain of pride." So Dakpo Rinpoche stayed under a rock for half a month to purify that stain. After half a month, Dakpo Rinpoche was really not expecting anything to happen, having lost the hope of expectation. When Milarepa called for him to come, he still had no expectations. At this time, Milarepa was sitting on top of a rock. 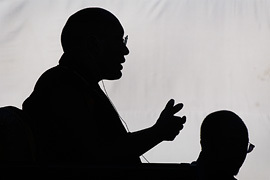 There he told Dakpo Rinpoche that their connection was very profound. "Actually," Milarepa told him, "although you have just come to see me, we were never really separated before." And when Milarepa said that, Dakpo Rinpoche realized that the three beggars who were fantasizing outside his retreat hut were really emanations of Milarepa himself. Milarepa then asked him what his name was now, and he replied that it was Sonam Rinchen. Milarepa then told him that "Sonam" means "merit," and that his merit was inexhaustible and infinite; and that "Rinchen" means "precious," so he would be very precious to all sentient beings. Having explained this, Milarepa then offered Dakpo Rinpoche a skull cup full of beer. At this time Dakpo Rinpoche was hesitant to take the beer. 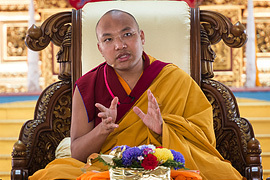 After all, he was a Kadampa practitioner, a fully ordained monk who was supposed to abstain from any drinking. Also, he was with the great Milarepa and surrounded by all of his students, who were also yogis. Because of all this, he was reluctant to take the beer cup. Milarepa said, "Get beyond this inhibition, abandon all these thoughts and preconceptions. Drink without any hesitation." 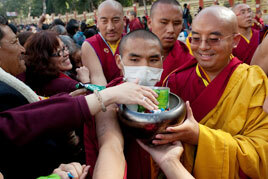 So Dakpo Rinpoche drank all the beer that was in the skull cup, without leaving a single drop. In this way, he symbolically obtained the total and complete teaching from Milarepa. As he was able to drink the beer without leaving a drop, he was able to obtain the complete teaching from Milarepa without missing any points or teachings at all. After that, Dakpo Rinpoche offered to Milarepa what he had brought: some gold dust and a bag full of tea. Milarepa said, "I have no pot, no vessel to boil the tea in, and," he said, "I am not that favorable to gold, either. You keep the tea. Also, you keep the gold dust. You might need to use it yourself." Saying that, Milarepa gave a very basic teaching and sent Dakpo Rinpoche off to meditate on that teaching for seven days. After seven days of practicing, he gained such vital energy that he did not have to rely on clothes for warmth. He was able to maintain his bodily warmth with a very thin layer of cotton cloth. He was also able to become absorbed in a very profound meditation. He only needed to breathe just once a day. He had reached a stage where his meditative contemplation became very deep and profound. When he went back to Milarepa and reported his great progress, Milarepa did not praise him nor find fault with him, but just told him to keep on meditating. So he went back to practicing meditation. This time he experienced being in a very dark world, so dark he was unable to see anything. At the same time he heard cries, but because everything was so dark he could not tell what was happening. Once again Dakpo Rinpoche went back to Milarepa and told him about this experience. Again Milarepa said that this signified neither grace nor damnation, and that he should keep on meditating. "In fact," he said, "when you are meditating there are changes in your nerve impulses and channel systems. So when you are sitting and feeling some changes in your usual perception, you are experiencing the meditative experience." Following the advice of Milarepa, Gampopa went and kept on practicing, and in his next experience he became very uncomfortable. He experienced dizziness and felt nauseous, and he thought that he must be sick. So he went to Milarepa and told him that he must be sick because he felt dizzy and nauseous. Milarepa said that he must keep on meditating, just as he had explained before, no matter what he experienced. But Milarepa added that this time the cause of the problem could possibly be that Gampopa had tied his meditation rope too tightly, and so he should loosen it. Then, Milarepa taught him some more yogas. Now, when we use the term "yoga," many of us immediately think of physical activity or exercise. The yoga that was taught to Gampopa at this time had much to do with vital air, or channels, which we call "tsa," and "tummo," the inner heat. It was yoga in that sense that Milarepa taught to Gampopa. Then he sent Gampopa back to meditation. So Gampopa went back and meditated. Now, when we are relating these biographies of enlightened beings, their progress seems to go so fast. But please, you must not expect results overnight yourselves. Although we heard that he (Gampopa) felt this, then went back, and then felt that and went back, he was probably meditating in isolation for many months. I am just telling a quick story, so please understand that. Gampopa went back with the instructions of Milarepa, and this time his experience was very fascinating. He was able to see very clearly the beings of the six realms, from the god realm to the hell realm. Not only that, he saw that they were all enjoying the milk of the stars, and it was a very fascinating experience. However, he also saw his own mother in a very weak condition. She seemed to be sick, with a very weak physical body. She was suffering from hunger and thirst, while all the other beings were enjoying the milk of the stars. He went back to Milarepa and told him of this experience, and Milarepa said, "Those are simply meditative experiences. Your previous experience of feeling nauseous was also a meditative experience. They come from the vital air entering the nerve channels and systems." Milarepa continued, "Now this experience of seeing beings of the six realms enjoying the milk of the stars happens when the 'tigle' enters into the vital nerve system. The reason you experience the suffering and starving of your mother is that you have one nerve system that was not opened when the tigle entered." 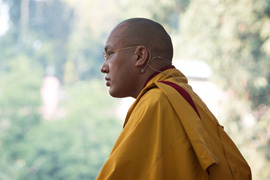 Because of that blocked channel, Dakpo Rinpoche experienced suffering. Giving him another yoga instruction, Milarepa then told Dakpo Rinpoche to go back and meditate without fear, expectation, or hope. At the same time Milarepa mumbled a word or two, and Dakpo Rinpoche thought he said, "There is a supreme being." 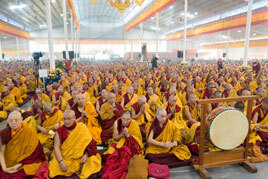 When he went back and meditated, this time he saw the mandala of the deities, the complete mandala of Chakrasamvara. He was able to see this complete mandala of the deities because he thought that was what Milarepa had meant by saying that there was a supreme being. Milarepa once again told Dakpo Rinpoche that this was neither a good nor a bad experience, and that he must go back and continue to meditate without fear or hope. He then gave him another yoga practice. This led to his next experience, seeing the solar and lunar eclipses at the same time. The way he saw it in his vision, the eclipse was caused by a very thin, thread-like cloud. This thread-like shadow had the capacity to completely obscure the sun and the moon. Dakpo Rinpoche went back again and told Milarepa about the experience of the eclipse. Milarepa said that it was neither good nor bad, it was just a meditation experience. This one was caused when the tigle entered into the two nerve channels, called "roma" on the left and "kyangma" on the right. The entering of the tigle into the right and left nerve channels causes the experience of the fine, thread-like eclipse. Although Milarepa again told Dakpo Rinpoche that his experience was neither good nor bad, and that he must continue meditating, this time he gave him some advice. "It seems," he said, "that you are exhausting your enthusiasm for meditation. You must meditate with less force, less tension. You must relax." Then, taking these words, and some new yoga instructions, Dakpo Rinpoche went back to meditate, as instructed by his guru Milarepa. Milarepa sent Sonam Rinchen (Gampopa) back to meditate many times and gave him many yoga instructions. Gampopa had by this time become very advanced in his meditations, and could accomplish them in very difficult situations with no discomfort. He learned lung (breath) practice (or prana, as it is called in Sanskrit) and supplication prayers to his guru Milarepa. Because of this advanced practice of meditation, he did not require much sleep at all. One night, after his midnight supplication, he took a short nap. During that nap he had a very auspicious dream, which was really composed of twenty-one very auspicious dreams, each revealing to him an auspicious sign. When he awakened, the sun was already up and shining. He set off immediately to tell Milarepa about these dreams and signs. Gampopa explained his twenty-one dreams precisely, one after another. Milarepa said, "In the past, I have not explained to you the meanings of the experiences you have had in meditation. This time I will explain every dream and every symbol." In the first dream, Gampopa dreamt that he was wearing a white hat, or crown, with a very long point. This symbolized that although there were many vehicles for the teachings, many traditions of teachings, his tradition was superior, as shown by the high point of the hat. 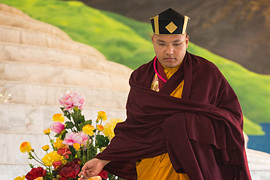 This hat was also surrounded by multicolored string, symbolizing Gampopa's complete union of profound prajna and compassion. The edge of the hat was also decorated with animal fur; this fur was black, with a red color within the black. This symbolized that Gampopa would not need to mix, or mingle, with other traditions; that he would have his own completely independent transmission. Gampopa also dreamt that on the top of his hat, at the very point, there was the feather of an eagle. This symbolized that Gampopa would realize the supreme, stainless view of mahamudra. Again Gampopa dreamt that he was wearing brand-new shoes, completely free from dust, mud, or stain. These symbolized the stainless commitment of Dakpo Rinpoche to keep every vow he took, such as the vows of the Hinayana, the Bodhisattvayana, and the Vajrayana. The shoes were new and very attractive, symbolizing how Gampopa would become an example, keeping and maintaining the Hinayana, Bodhisattvayana, and Vajrayana vows in the future. The shoes were also decorated with four blue circles: one on the point of the left and another on the point of the right, and one on each back. 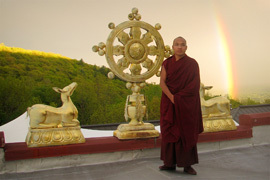 These four circles symbolized that Gampopa in his lifetime would come to complete realization of the four kayas: dharmakaya, sambhogakaya, and nirmanakaya, and the svabhavikakaya. Also, they were Tibetan shoes, the kind of Tibetan shoes, or boots, that come to below the knee and have to be tied with a string or rope. Gampopa dreamt that at both ends of the rope that tied the shoes were two silver rings. These symbolized the unselfish conduct and behavior of past bodhisattvas, and that throughout the life of Gampopa he would never show selfishness, but always compassion, in the manner of past bodhisattvas. Gampopa also dreamt that he was wearing a very thin white cotton cloth wrapped around him. This cloth symbolized that although Gampopa as a teacher would have many defiled and neurotic students in his lifetime, his mind would always remain as stainless as the white cotton cloth. Gampopa also dreamt of a golden-colored silken shirt, symbolic of Gampopa's unshakable, immovable kindness to all living beings. It meant that he would never discriminate between good and bad students, or high or low castes; his kindness would always extend to all beings. He was like gold, in that no matter what you do to it, whether you burn it or beat it, the color of gold always stays the same. Such was the immovable kindness of Gampopa. The cotton cloth in the dream had many multicolored dots on it. These symbolized that every living being could benefit through Gampopa's skillful means, and that each would benefit according to its capacity. Gampopa dreamt that he wore a woven belt, wound around his waist three times. This symbolized that in the past, present, and future, Gampopa would keep pure and stainless the commitment, the samaya of the Hinayana, Bodhisattvayana, and Vajrayana vows. The belt was decorated with white flowers connected with white pearls. These symbolized that Gampopa would master the three learnings, those of discipline, meditative contemplation, and wisdom, and that he would become an example to future students of how to master the three learnings. He was also wearing a white blanket made of pure wool over the white cotton cloth. This symbolized that whatever Gampopa might be doing externally—walking, teaching, sleeping, meditating, whatever—his mind would never be separate from the essential nature of dharmakaya. This white wool blanket was stitchless, free from any threads, and not cut, just naturally the right shape. This symbolized that Gampopa's realization of the dharmakaya was stainless and free from any doubts or conflicts. Gampopa's experience was pure, free from any negativities, and that purity was symbolized by the blanket having no threads or cuts. The white blanket was decorated with a silver coin, round and somewhat flat. This symbolized that his realization of dharmakaya was not inferior or superior to that of Shakyamuni Buddha. In the dream he was carrying a long stick that was made of sandalwood, which symbolized that Gampopa had found an authentic master. The sandalwood stick was decorated with fine precious stones, symbolizing the knowledge and qualities of his master, his guru Milarepa. Along the middle of the stick there was an interwoven golden line. The golden line symbolized the unbroken, exact, ear-to-ear transmission that Gampopa had received and realized, deep in his heart. It was interwoven, symbolizing that in the future Gampopa would be able to spread this ear-to-ear transmission to many other practitioners. His holding of the stick in his right hand symbolized that whoever became his student, whoever followed his teachings, in the future would become liberated from suffering and would progress toward complete Buddhahood. Gampopa dreamt that in his left hand he was holding an empty skull (kapala), symbolizing the emptiness of all phenomena as well as the realization of that emptiness. This empty kapala was being filled with a yellow-gold nectar (amrita), symbolizing that Gampopa's spiritual growth would always develop and increase. The yellow color of the nectar symbolized Gampopa's ability to remain in the natural state of clear light. Dakpo Rinpoche dreamt that on his right shoulder were two tsampa bags filled with white rice, and that his left shoulder was covered by an animal skin. This was a kind of skin that is exactly in the form and shape of the animal it came from, with the legs and head left on. By covering his left shoulder, it symbolized that he would maintain the mindfulness, alertness, and accomplishment of the bodhicitta. Its having the four limbs and head symbolized that Gampopa would be benefiting all sentient beings, again with the mindfulness of the bodhicitta of the four limitless meditations. He began to use this skin as his mat, which symbolized that he would accomplish the realizations of emptiness compassion, and inspire such in his followers. In the dream, Dakpo Rinpoche looked on his right side and there beautiful meadows of small hills covered with yellow grass. That symbolized Dakpo Rinpoche's mastering the knowledge and meditations of his own tradition, as well as all the traditions of all beings. In fact, he became known as the Knower the Three Times, meaning that nothing is excluded from his knowledge. In this same meadow he saw a beautiful mountain also covered with yellow grass, with baby yaks and lambs grazing on this meadow, enjoying the grass. This symbolized that Dakpo Rinpoche would not only benefit living beings through revealing the Dharma and making teachings available, but by giving the generosity of protection and of loving-kindness. Then, in the dream he became a shepherd, someone to look over the lambs and young yaks. 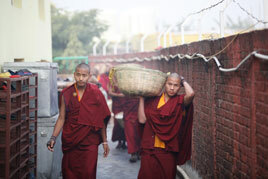 This symbolized that Dakpo Rinpoche's activities to benefit beings would be endless, just as sentient beings are endless. Then, Dakpo Rinpoche looked on his left side, and there he saw another meadow, perfectly even, covered with a beautiful blue grass, the color of turquoise. This was symbolic of his profound meditative realization, or samadhi, and his realization of the ability to remain in this profound state regardless of day or night. This beautiful meadow was also filled with flowers of varied colors: red, white, yellow, and so forth, symbolizing that he would also accomplish and experience the physical warmth of the meditation. This is not just ordinary physical warmth, but meditation warmth. In this dream, Dakpo Rinpoche also dreamt that uncountable attractive women were prostrating themselves to him, with reverence and devotion. These were uncountable beautiful dakinis. 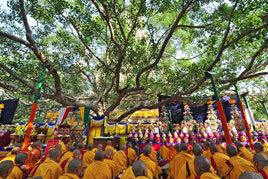 By maintaining the unbroken and pure discipline of the monk, and other samayas, he symbolically subdued all the dakinis. In the very center of the meadow, forming a beautiful garden, were many groups of yellow flowers growing together. This symbolized that Dakpo Rinpoche would attract uncountable students and followers, effortlessly attracting them in the future. Just like clouds gather in the sky without needing the sky to invite them, students would gather and form around him in the future, effortlessly, naturally. In the center of all the yellow flowers, growing higher than all the others, was a huge yellow lotus, which had about a thousand petals. This symbolized that through the strength of Dakpo Rinpoche's prajna, his wisdom, he would be superior to, or above, all the beings of the three worlds. This means the complete attainment of enlightenment. In the dream, Dakpo Rinpoche sat on top of that lotus with a thousand petals in a bodhisattva posture, symbolizing that in the future he would benefit beings with ceaseless, endless emanations. Dakpo Rinpoche also dreamt that having sat on top of that lotus flower, in front of him he saw a huge fountain of water springing from the earth. This symbolized that he was the source of all the four greater Kagyu schools, the eight lesser Kagyu schools, and, in short, all the Kagyu traditions. Not only was he the origin, but he would continue, like the water fountain, to be the source of the Kagyupa traditions. Behind him emanated a white light, or aura, which symbolized that his lineage, his teaching would be established and spread in all Tibet, as the sun gives forth light to all beings everywhere. He dreamt his body was surrounded by huge burning flames, symbolizing that the blissfulness of his realization and the warmth of his meditation would burn away all external pain, suffering, and cold. He dreamt that from his heart was radiating the light of the sun and the moon, symbolizing that from that very moment until the end of his life, Dakpo Rinpoche would not experience any need for sleep, but would instead transform all his sleep into the clear luminosity. Having explained the many significances of Dakpo Rinpoche's dream, Milarepa noted all the auspicious predictions in it for his future. "However," he said, "although it is very auspicious, and a good omen for the future, you must again learn not to become attached to the dream, or to develop expectations from the dream. Nothing can be so positive that it could not turn negative if we hope or expect." In the same way, Milarepa advised Dakpo Rinpoche not to take any negative dreams seriously either. All negative or painful dreams are illusions, not real. If we can see them as they are, and avoid becoming attached to their negative meanings, they become positive things for us and enrich us for further development on the spiritual path. "So," Milarepa advised Gampopa, "you must learn to see the negative dreams as illusion and not to take them seriously, nor should you become attached to the meanings of positive dreams; that is the practice of the yogi." Having explained the dream to Dakpo Rinpoche, Milarepa now said, "You no longer have to stay with me. As you have reached complete realization, you must go out and benefit beings." And Milarepa directed him to the East, to a place called Gampo Trashi Rewo, where he was to begin benefiting beings. In this place there was one huge mountain, and like a jewel in a mandala it was encircled by seven other mountains, or like a king on a throne it was surrounded by seven reverent bowing ministers. (Khenpo Rinpoche notes that of all the scenery in Tibet, this landscape seems to be the most breathtaking.) And this is where Milarepa sent Gampopa to begin benefiting beings. As his parting teaching, Milarepa explained to Gampopa: "While you are out there alone, benefiting beings, you may miss many things. Sometimes you may miss food, and at these times you must enjoy the food of meditation; sometimes you may experience cold and miss having clothes, and at these times you must enjoy the inner heat of tummo; sometimes you may miss your guru, and at these times you must remember that your mind and the mind of the guru are inseparable. There is no greater guru than the awareness or realization of the inseparability of your own and the guru's mind." When Gampopa left, Milarepa told his students, with a sense of extreme joy, that the "U-pa Tonpa" (another name for Gampopa) would be a great being and benefit many beings. ("U" is central Tibet, and "pa" means "person," so "U-pa" means a person who comes from central Tibet, and "Tonpa" means "teacher.") Milarepa told them that he had had a dream about a white crane that flew high in the sky and perched on top of a huge, tall mountain. Having perched there, he then attracted uncountable other cranes, which landed there. Suddenly they all scattered, and the land of Tibet became white with cranes. This dream symbolized, said Milarepa, that Gampopa would be spreading the Dharma widely in Tibet. According to the advice of Milarepa, Dakpo Rinpoche went toward that special mountain, and as he went he attracted many students. Now all the students that he attracted were really emanations of students of Shakyamuni Buddha. (Remember that in the very beginning of this story, Dakpo Rinpoche was present for the teaching by Shakyamuni Buddha of the Samadhi Raja Sutra, when all the other students made a commitment to support him in spreading the Buddhadharma.) Because of this, these students had been in the Dharma for a long time. Therefore, when Dakpo Rinpoche simply gave one instruction, they all had realization, without having to go through hardships of the practice. 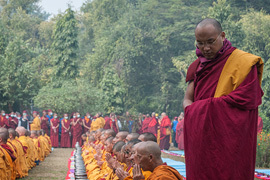 So in that manner, the 51,600 students, who were emanations from the time of Shakyamuni Buddha, received Dakpo Rinpoche's teachings and promised to support them. Out of all these students gathered together, there were three outstanding students who became known as the three Khampas, because they all came from the eastern part of Tibet, known as Kham. One of these students, whose name was Dogyal, was a direct emanation of the Buddha himself, who had promised, with his students, to support Dakpo Rinpoche in spreading the Dharma. The second one was from Due, the Due Khampa. 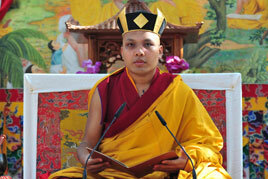 This student's name was U-ser, and he was to be His Holiness Karmapa, The First Karmapa, Dusum Khyenpa. He was called U-ser because "U" means "head," and "ser" means "gray". Since he had been born with gray hair, he got the nickname "grayhead." The third one's name was Saltong Shok-gam and he was from Namchen. "Sal" means "clarity," "luminosity," and "tong" means "emptiness," "sunyata." "Shok-gam" means "harelip," so his name, Saltong Shok-gam, meant "the one born with a harelip who has the realization of clarity and emptiness." 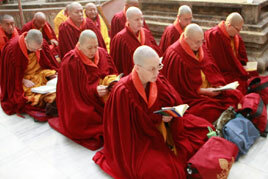 Except for the three Khampas, all the rest of the 51,600 students kept extremely pure discipline of the vinaya, or monastic ordination. The three Khampas, however, were very, very wild. Because they were completely realized, they were beyond any negative accumulations for their actions. So they did not keep the strict discipline of a monk. 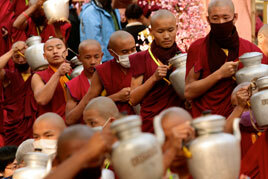 Over and over again they asked permission of Dakpo Rinpoche to let them drink alcoholic beverages. Finally he gave them permission and told them they could have three skull caps of barley beer each. They were pretty happy with that. One day, they took their beer up into the mountains to a beautiful location. 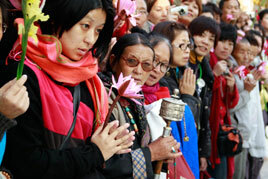 It was the Vajrayogini day, the 25th of the month on the Tibetan calendar. So because of the day, and because they wanted to show how the beer didn't really affect them, they decided to perform some miracles, as a gesture. So Dorje Dogyal was chasing the trees of the forest, and they were all running from him. And Saltong from Namchen was bringing water in a fish net. Then U-ser performed a miracle such that from the tip of one finger came the wind, and from the tips of all his fingers on his other hand came air and fire together. And they were having a wonderful time performing miracles. They had a great day on top of the mountain. They enjoyed the beer, performed many miracles, and sang many doha songs. In the evening they returned to the monastery, where all the other students lived. Yet they were still excited, having enjoyed themselves so much, and they were still singing and dancing. 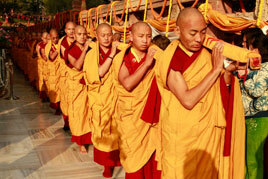 Now every monastery has a chotrim, someone to take care of the discipline. You might call him a monk bully, or bouncer. Singing and dancing were not permitted at all in the monastery, and this disturbance annoyed the chotrim very much. He began to beat them with his long, broad stick and told them they must leave the monastery immediately. Dogyal requested that they be allowed to spend the night, as it was already dark outside. The chotrim let them stay the night, but they had to agree to leave before dawn. So before dawn, the three of them left the monastery, beginning the long climb down the mountain into the valley. Now it happened that Dakpo Rinpoche himself was not actually in the monastery but above it, in a retreat hut, practicing meditation. He told one of his attendants that he had seen, as if in a dream, a vision of all the dakas and dakinis leaving the monastery, and he wanted to know what was happening there. 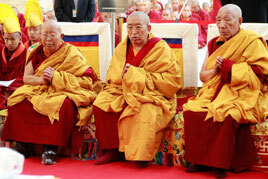 Dakpo Rinpoche felt that maybe something had happened to those three yogis (he called them Milarepas). So he sent his attendant down to see if anything had happened. When his attendant reached the valley, he saw the three yogis prostrating themselves toward Dakpo Rinpoche. They were doing this because they had not been able to say good-bye to Dakpo Rinpoche, because the chotrim had made them leave. The attendant returned and informed Dakpo Rinpoche that not only were the three yogis leaving, but all the birds were leaving along with them and not only were they making prostrations, but the grass and trees were bending toward where they were departing. Dakpo Rinpoche knew that their leaving was not good; he knew that the gathering of so many students was because of the commitment of these emanations from the time of Shakyamuni Buddha. So Dakpo Rinpoche himself went down to the valley and asked them please not to depart. After requesting them not to depart, he sang a song that explained who these three yogis were, how they were not ordinary beings but emanations of past enlightened beings who had been present during the time of Shakyamuni Buddha. 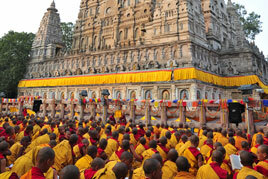 Knowing this, the others at the monastery never again had negative feelings toward the Khampas' unusual behavior. 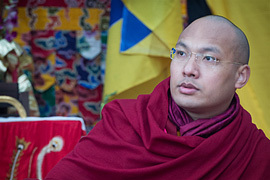 Dakpo Rinpoche passed away in 1053, and later the four main students of Dakpo Rinpoche (there were four by then) spread his teachings by what have come to be known as the "four great" schools of the Kagyupa. 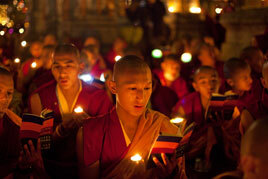 Then there were eight students of Dogyal, who also spread the teachings in the "eight lesser" schools of the Kagyupa. Now the four schools of the Kagyupa are not very different from each other except in very little ways, all having the same origin. The various forms of teachings only make them more available to many. In total there are twelve traditions, twelve schools of Kagyupa, (four greater and eight lesser), all deeply rooted and cultivated in the soil of Tibet, and spread very effectively in China. 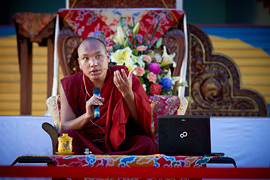 This teaching was given by Khenpo Karthar Rinpoche at KTD. Woodstock, March 25-30, 1986. It was translated by Chojor Radha, and this article was edited by Andrea Price.